Worm Wheel Hobs are manufactured in bore type and shank type in single or multi-start, topping or non-topping as per DIN, BS specifications or as per customer’s requirement. Worm wheel hobs require marginally more clarification than alternate sorts of hob, in truth this kind of hob have some extremely impossible to miss normal for which professionals must know. It is to be discovered generally much of the time in workshop since it is utilized for a segment of speed reducers which are used in an extensive variety of parts. It is initially important to call attention to that are four distinct sorts of worms which have diverse profiles and the geometry of which is characterized by the DIN 3975 standardizing. Worm Wheel Hobs are made accessible by us according to Din and BS particulars with fixing or non-topping profiles. The Worm Wheel Hobs produced by us are planned by specialists and tried on a few quality viewpoints, to ensure unrivaled execution for a more extended time than comparable Gear cutting devices accessible in the market. We for the most part give Worm Wheel Hobs is ZK sort guidelines. 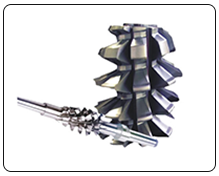 Availability Material : M35, ASP2030, ASP2052 Type : Bore or Solid Body (Shank Type)Designs : Single and multi start Accuracy : ‘AA’, “An” and “B” according to DIN3968 . Used to Cut : Worm Gears in Reduction outfit boxes Machinery.